WASHINGTON -- Republicans pushed veto-threatened legislation to build the Keystone XL oil pipeline through a Senate committee Thursday, but Democrats blocked plans for an immediate debate in the full Senate. The Energy and Natural Resources committee moved the bill closer to the floor on a 13-9 vote. Sen Joe Manchin of West Virginia, one of six Democrats sponsoring the bill, was the only committee Democrat to support it. The House will vote Friday on its version of the bill and is expected to pass the measure easily. A few hours after the committee voted, Senate Majority Leader Mitch McConnell sought to begin Senate floor debate on the measure. Democrats objected, setting up a test vote for early next week that the bill is expected to clear easily. The pipeline bill, the first piece of legislation in the Republican-controlled Senate, is on a collision course with the White House, and neither side appeared to be giving any ground on Thursday. The new energy committee chairman, Republican Sen. Lisa Murkowski of Alaska, urged colleagues not to be deterred by the veto threat, reminding them that the bill fell just one vote shy of Senate approval when Democrats controlled the chamber last year. This time, the bill already has enough support to overcome a filibuster: 54 Republicans and six Democrats are sponsors. But supporters acknowledge they remain short of the numbers that would be needed to overcome a veto and already are discussing other means to get the pipeline approved. Prior to the committee's vote, McConnell called on Obama to rescind his veto threat. "So for a president who has said he'd like to see more bipartisan cooperation, this is a perfect opportunity," McConnell said in a statement. While the $5.4 billion project has become a political lightning rod, it will have minimal impact on issues the two sides care most about. For Republicans, it is about jobs, and for liberal Democrats, it is about their concern about worsening climate change. 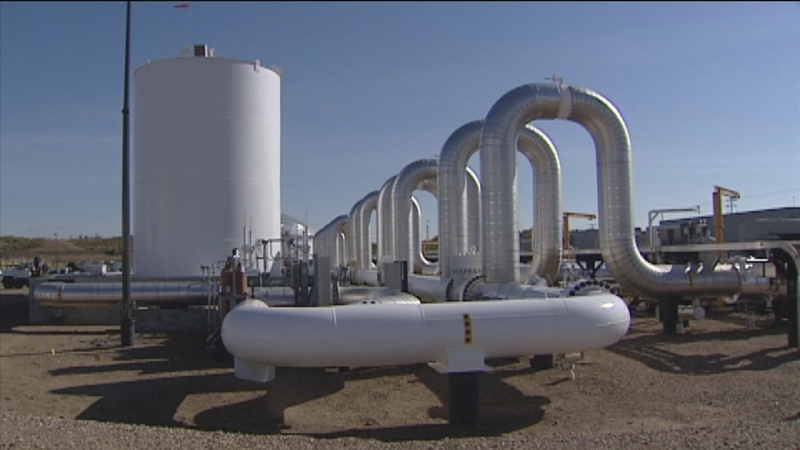 In the State Department's evaluation of the pipeline, now on hold until a Nebraska court rules on the pipeline's route, officials said the tar sands would be developed regardless of whether the pipeline was built. The same review said that during the two-year construction period, about 42,000 jobs would be created, but only 3,900 would be directly related to the pipeline that would carry oil from tar sands in Canada to the Gulf Coast, where it would be refined. Democrats held off on introducing most amendments Thursday, saving them for the Senate floor. But in comments that gave a hint of the debate to come, Sen. Bernie Sanders, a Vermont independent, offered an amendment that would put the entire Senate on record as recognizing that global warming is a threat and that the United States needs to transition as fast as possible away from fossil fuels. But he lost the attempt to add the amendment to the bill.